La Acadamia Partnership Charter School Esports Club is one of several after-school programs benefitting from the "Supporting Diversity, Equity and Inclusion in Esports" PAsmart Grant. "Merging learning and socialization provides an important new bridge between students, parents and teachers." Pennsylvania Secretary of Education Pedro Rivera announced today that the Emerald Foundation has been awarded nearly $500,000 in a PAsmart Advancing Computer Science & STEM Grant for its “Supporting Diversity, Equity and Inclusion in Esports” program. “Supporting Diversity, Equity and Inclusion in Esports” will infuse STEM learning into a passion students currently embrace: video gameplay. The North America Scholastic Esports Federation (NASEF), founded by the Samueli Foundation and managed on the east coast by the Emerald Foundation, was created to provide opportunities for ALL students to use esports as a platform to acquire critical communication, collaboration, and problem-solving skills needed to thrive in work and in life. This new program in Pennsylvania will bridge the gaps between the highest and lowest performing students through highly engaging instruction, ongoing opportunities for team collaboration, creative problem-solving, and competitive fair play. This esports initiative, launched as a scholastic club, will target a minimum of 300 high school students in fifteen after-school programs in Lancaster and Lebanon counties. All clubs will have the opportunity to compete virtually with others across North America, as well as gain free access to educational toolkits, webinars, virtual coaches, and other support. The grant also provides funding for a traveling esports arena enabling schools to host regional competitions. Supporting the esports game player is an ecosystem of positions critical to the success of the club, including theory crafters, analysts, event organizers, IT support, web developers, streamers, fandom art, shoutcasters and more. 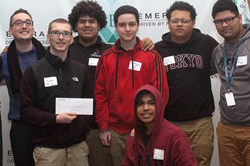 The Emerald Foundation is partnering with organizations like the Lancaster Chamber of Commerce and Industry to connect students through the continuum that extends from STEM / computer science interest to workforce development. As the next phase in Governor Tom Wolf’s PAsmart initiative, more than $30 million in grants was secured to invest in education and workforce development. By expanding classroom instruction and professional development in the fast-growing fields of STEM and computer science, this funding will also provide opportunities for training with in-demand careers, emerging industries, and underserved populations. The Emerald Foundation is an independent 501(c)(3) non-profit organization established in 2010 by Emerald Asset Management CEO & Founder Joseph Besecker and Martha Besecker. The Emerald Foundation has historically contributed funding to worthy charitable, non-profit organizations that focus on education, youth, and healthcare research. Learn more at https://emeralde.org/. Founded in 1991, Emerald Asset Management subsidiaries provide equity-focused portfolio management services to institutional investors and to individual investors via separate account management and the Emerald Mutual Funds. Learn more at http://www.esportsfed.org. Members of the press can find videos, infographics, and leadership profiles in the online press room. Join online conversations on Twitter @NASEFedu , on Facebook and Instagram, and see matches streamed live on our Twitch channel.